With four days to go for the nominations for the polls in three provinces, signs of winning-at-all costs have already emerged amidst poster wars and reports that parties are preparing to field their big guns. Nominations will be accepted from political parties and independent groups at the nine district secretaries in the three provinces – the Northern, North-Western and Central – from July 25 to August 1 for the September elections. 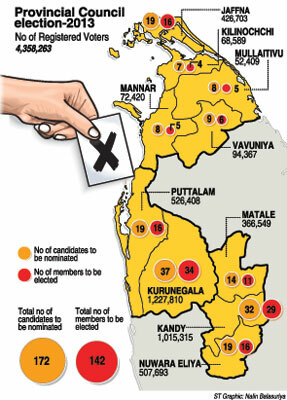 Some 4,358,263 have registered to vote in the three provinces to elect 142 councillors as the country debates the merits and demerits of the provincial council system which was introduced in terms of the 1987 Indo-Lanka accord. While the Jathika Hela Urumaya– a harsh critic of the PC system and government ally – is yet to decide whether to contest the polls, the National Freedom Front, another opponent of the system and government ally, is likely to field candidates on the ruling United People Freedom Alliance (UPFA) ticket. A significant feature at the upcoming contest is the entry of the Democratic Party led by the war-winning former Army Commander Sarath Fonseka. The elections will be a popularity test for his party which will field candidates for the North Western and Central Provinces. In these two provinces, the Sunday Times learns almost all the members of the dissolved councils are set to receive nominations. In the Central Province, former Chief Minister Sarath Ekanyake will lead the UPFA. The main opposition United National Party (UNP), which last won a provincial poll in 2002, is to field former Health Minister Renuka Herath — from the Nuwara Eliya district — to strengthen the party’s list. The party lost three of its Central Province heavyweights after they crossed over to the government side after they were elected on the UNP ticket at the last provincial poll. Central Province former Opposition leader K.K. Piyadasa is among those due to contest on the UNP list from the Nuwara Eliya district. The Sunday Times also learns that five minority parties including the Upcountry People’s Front, Mano Ganeshan’s Democratic People’s Front and the Puravesi Peramuna, are holding talks to contest the CP polls under a common alliance in the Nuwara Eliya District. In the Central Province District of Kandy, adding strength to the UNP is the entry of former High Court Judge W. B. Waraweva, who gave the dissenting ruling in the ‘white flag’ case against Sarath Fonseka. Also for the UNP, ex-MP Ranjith Aluvihare is set to make a comeback to politics by contesting the Central Provincial polls from the Matale district while several other prominent UNP members including former journalist and MP Sanjeewa Kaviratne and Ex-MP Wijeratne Banda’s son-in-law Rohana Bandaranayaka are also to contest the polls. The UPFA’s alliance partners, Sri Lanka Muslim Congress and the Ceylon Workers Congress, are planning to go it alone in the Matale district. The JVP’s Matale district candidates are likely to be led by its former PC member Gamagedara Dissanayake. 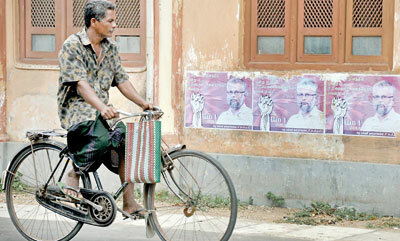 In the North Western Province, the writing is on the wall already for an intense intra-party battle for the Chief Ministerial post. 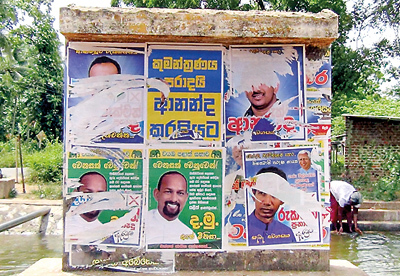 Posters have come up, with one set promoting Athula Wijesinghe as the chief ministerial candidate and the other promoting Sarath Nishantha. The former was the chief minister of the dissolved council and the latter its fisheries minister. But adding another dimension to the battle is the possible crossover of popular UNP MP Dayasiri Jayasekera to the government side. President Mahinda Rajapaksa at a recent meeting with the province’s UPFA members has reportedly asked whether they had any objections if Mr. Jayasekera contested on the UPFA ticket. They had said no. A poster that is attracting everyone’s attention in the North Western Province district of Puttalam is that of the controversial provincial councilor Ananda Sarath Kumara who drew widespread fury on him by ordering a teacher to kneel before other students for disciplining his daughter for wearing a short uniform. (See related story on this page.) The poster carries the slogan ‘defeat the conspiracy’. His is not the only poster with a catchy slogan. A likely UNP candidate Shantha Abeysekara’s poster says ‘Wayamba peralana ali kulappuwa’ (The elephant rampage that overturns the North Western Province). Another possible UNP candidate Ananda Adhikari’s poster says ‘Menna thawath chanda prathipalayak’ (Here is another election result). Also in the Puttalam district, a cold war is brewing between two rival candidates for the right to be identified with the late minister Damoo (D.M) Dassanayake who was killed in an LTTE bomb blast in 2008. Former UPFA PC member Indrani Dassanayake, widow of the late minister, is contesting again while another Dassanayake clan member is contesting on the UNP ticket with his posters carrying a picture of himself that resembled the late minister. The slogan under the bearded man’s picture says, ‘Da. Moo ape minisa’ (D.M is our man). In the Northern Province, the Eelam People’s Democratic Party (EPDP) of Minister Douglas Devananda, the All Ceylon Muslim Congress of Minister Rishad Bathiuddin and several left parties have agreed to contest under the UPFA banner. The TNA is fielding a strong team headed by retired Supreme Court Judge, C.V. Wigneswaran for the first ever for the newly constituted Northern Provincial Council. Several leading politicians’ sons and relatives have sought nominations for the upcoming polls. Minister Milroy Fernando’s son, a close relative of Minister Dayashritha Tissera and Minister Johnston Fernando’s son are among the possible candidates. The Court of Appeal on Friday listed for support a petition that challenged the conduct of the elections in the Northern Province. The petition filed by Sinhala Jathika Peramuna (SJP) Secretary Jayantha Liyanage was listed for support on August 06. The petitioner is seeking the court to issue an order preventing the Commissioner of Elections from conducting the NPC polls in September on the grounds that the resettlement of the displaced Sinhala and Muslim people and the clearing of mines in the Northern Province have not been completed. The petitioner said it was not reasonable to conduct the northern elections without these two tasks being completed. Following a request from the petitioner’s lawyers, H.B. Gunasekara and D. Weeraratne, the Court of Appeal bench headed by its president Justice Sri Skandarajah allowed the petition to be amended. The SJP has also filed a petition in the Supreme Court seeking a declaration against four Tamil parties on the grounds that they are violating the Sixth Amendment which states that no political party or other association or organisation shall have as one of its aims or objectives the establishment of a separate state within the territories of Sri Lanka. The party in its petition has cited Ilankai Tamil Arasu Katchi Secretary S. Senathirajah, Tamil United Liberation Front President V. Anandasangaree, Tamil Eelam Liberation Organisation Secretary N. Indrekumar, and Eelam People’s Revolutionary Liberation Front Secretary K. Premachandran as respondents. Errant politicos continue to hold sway; say incidents aimed at tarnishing political careers!